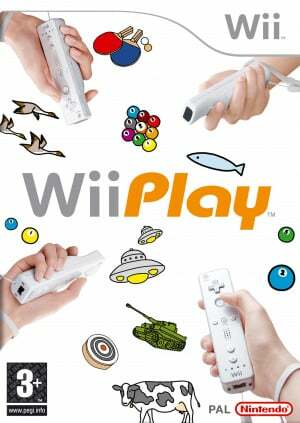 Wii Play is developed by Nintendo and its main purpose is to introduce players who have never used a Wii Remote before to the device. It even says so on the back of the box. Yes you can learn the basics by playing any other game until you get the hang it but that game may not feature all required movements. You may come to a new game which requires a twisting motion and may not be prepared for it. This in where Wii Play comes in as it teaches you how to play, technique by technique, in a step by step process. One you have learnt the all of the movements individually, they are all merged together in the later games so you can learn ‘naturally’ and smoothly. Now on to the actual game, or to be precise, compilation of mini games. There are nine games in total which require you start from number one the first, making way to the final game and only then will all games be playable in multiplayer. In this review I will take the same tact. First up is Shooting Range, which can be compared to Duck Hunt. It doesn’t contain the nostalgia of the old classic but it has all the elements there, with more thrown in. It is all very simple (that’s a theme that will run with every mini game); you use the remote as a gun and shoot the balloons/targets/ducks/clay pigeons/faces on the screen in quick secession to rack up points. The “faces” listed back there are the images of Miis which periodically appear; you must be careful not to blow up your own face. 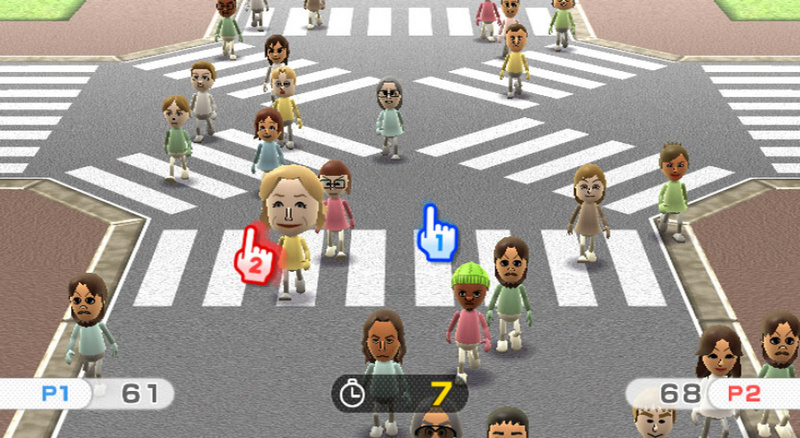 Wii Play is one of the few Mii compatible games and uses it considerably in Find Mii, a Where’s Wally style game. In this next game you have to pick similar looking Miis out of a crowd, pick the odd one out, and even find your handsome self. There is not much else to it really which means it gets old quickly. 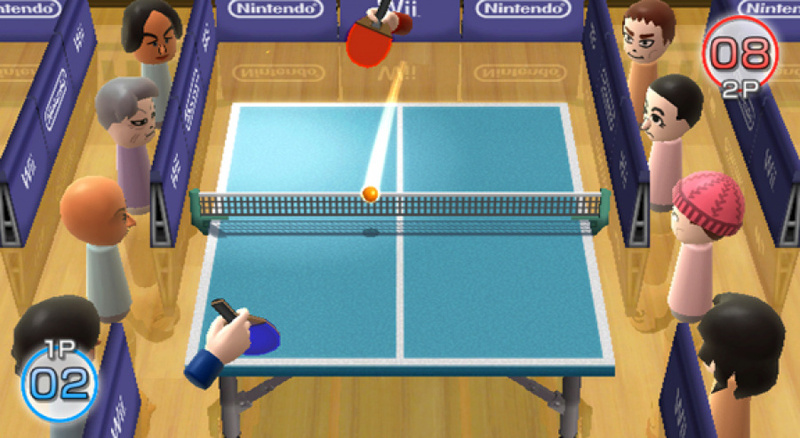 Table Tennis, the next game, is again simple but this time provides more replay value not only because it is a sport but it also can take a while to master. It is not pure Table Tennis as it is more a case of getting your paddle to the ball rather than actually moving to hit and aim. Even in its simple state the variant of Tennis can be very enjoyable especially as in a long rally it will become extremely fast and difficult. 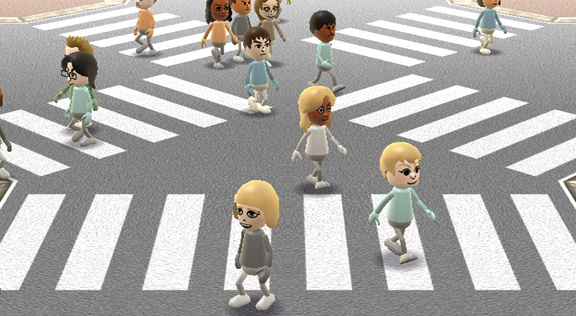 Perhaps the most unique game in the compilation is Pose Mii. As you can probably tell from the title this uses your Mii again. The point of this game, other than fun, is to teach a novice the ability of twisting the remote. 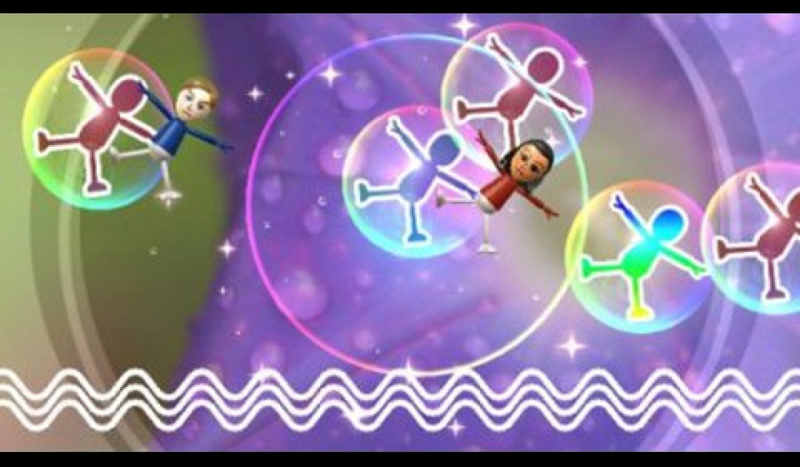 You control a Mii which you will have to insert inside a silhouette of the same shape as it floats down towards the perilous bottom of the screen. There are three possible shapes which require you to alternate between shapes using the two main buttons. The education begins on the slow side with only a couple of shapes on screen and takes a while to pick up the pace to where the silhouettes come down fast, and plentiful enough and to actually challenge. This can be very frustrating to wade through the beginner phase to the end where there is no real reward. Laser Hockey, a mix of Air Hockey and Pong, is one the best. It takes the classic table game of the former and puts it in the visual style of the latter, only with more flashy effects. This is perhaps the hardest of the games and because of this difficulty it is also maybe the most fun. A best out of 15 goals multiplayer match will be an interesting battle as both wits and speed are needed as the puck flashes from side to side. Another good game for multiplayer is 9-ball Billiards which follows the traditional rules. The remote is a perfect substitute for a cue and although it is only one handed can be used to accurately hit the cue-ball with the desired force. 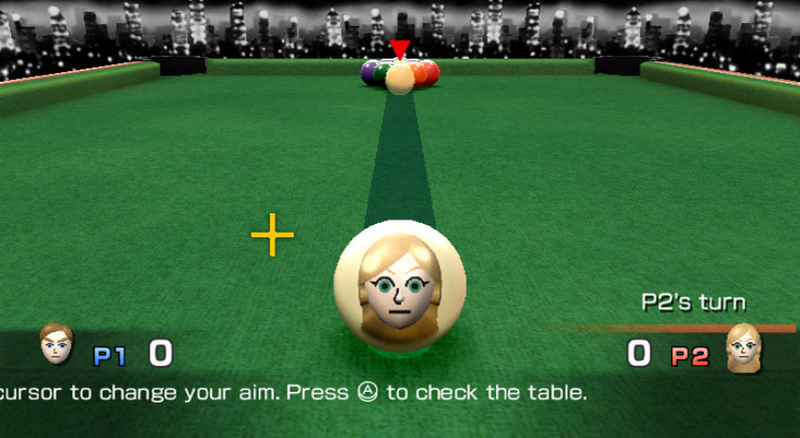 Pool or Billiards is a basic game anyway and sits in Wii Play naturally, however as all mini games have made been very simple; the physics have been modified so that balls roll around as if on ice which makes potting a bigger possibility, and sometimes too easy. Nevertheless Billiards is a highlight of the package. Fishing is a poor representation of the ‘sport’ and does not reach the quality from the likes we have seen in the Zelda series. The awkward view from which you fish hinders the relaxing art of fishing as it is hard to set some of the fish. Hooking a fish is a very hit or miss affair as it seems random when they will bite. The remote is ideal for the game but it is the fishing area and its inhabitants which let it down as it is all too easy. Moving swiftly on, the last two games have exclamation marks at the end of the name showing they mean business and the first, Charge!, definitely comes through on the promise. It is perhaps the most fun because of the peculiar way in which ride a cow along a track knocking down scarecrows and jumping over fences. This time around you will have to rotate your remote to the horizontal and tilt it to gallop forward and turn, moving the remote up quickly will make your cow jump. It is particularly exciting in multiplayer as you rush to knock down the scarecrows before your opponent can get there. Tanks! is the final mini-game in the set and the only one to utilise the nunchuck even though it is not included. It is possible to play with the D-Pad instead but is not as effective. Tanks! is yet another game taken from an old arcade classic and even assumes the same name, apart of course from the exclamation mark. The remote controls the angle of your tanks cannon from a top down view and the nunchuck moves the vehicle of death around an obstacle filled map. All you have to do is destroy the other tank(s) before they get you, all very simple as usual and a nice end to a pleasant game. All games are multiplayer enabled but only for you and one other. It does not match the four player action of Wii Sports, nor does it have the same depth. There are only two or three stand out games but these may be a good enough reason to purchase Wii Play considering it is only five pounds more than a controller on its own. Wii Play would not be at all worth it if it did not include the “free” remote. The actual way it should be seen is a remote with a few mini games included for a couple of extra pounds. Considering that the game is essentially a teacher’s aid; it is surprising it was not released with the console itself in place of Wii Remote manual. You should only really consider this if you would like an extra controller. If you already have four you do not really need this. The mini-games can be fun but if you can hold out for Wario Ware or Mario Party there will be a lot more than nine mini games to interest you. If you are getting a controller anyway £5 is not a lot to spend for a game to add to your collection. I think Wii play is good fun! The one player game will only last about 20 minutes. However, with 2 players, it becomes incredibly competitive! It successfully teaches beginners about the new method of control possible. That said, Wii Play is really short, I'd be a little more generous at 7/10. This is a good game, but after a while it gets: B. O. R. I. N. G. not even a 7 year old can read the word boring !!! 9/10. Enormous replay value if you give it a chance. One of the very best family video games ever as well. it's not suitable for new WiiRemote dynamics. Why do you guys have to mistreat it after my bro got it at Game stop yesterday? I've played at my friends' house and the mingames were fun but took a little getting use to. But I never played it fully and don't want you or anyone else ruining that!